Varifold's most cost effective panel construction. With a 55mm panel thickness, the VARIWALL Screenmaster 550 series offers extremely easy operability at an affordable price. With a wide variety of work surfaces to choose from, ranging from dry-erase boards and chalkboards to tack boards and cork boards, you can add functionality to your office or classroom. The VARIWALL® Screenmaster 550® series is a cost efficient solution for planning space that requires a visual screen rather than a sound barrier. Since the panels have a nominal thickness of only 55mm, it requires a smaller storage area thus providing more useable space. Also, because the panels have a load weight parameter of only 15 kgs/m2 up to 25 kgs/m2, a lighter and inexpensive overhead support system can be used. Of course, the best benefit is that it is the most economical partition available in its class. However, this series is still available in three Sound Transmission Class (STC) models 25, 30 and 35. Varifold's VARIWALL® line has been certified by a HOKLAS (Hong Kong Laboratory Accreditation Scheme) accredited laboratory. The Screenmaster 550® series features VARIWALL®’s advanced track and carrier systems. Its panel trims are made of heavy duty anodized architectural grade aluminum alloy 6063 T5, with a pair of deep-nesting, semi-flexible, extruded polyvinyl TONGUE seals on aluminum GROOVES. It can be used up to a height opening of 4 meters and an unlimited width span. 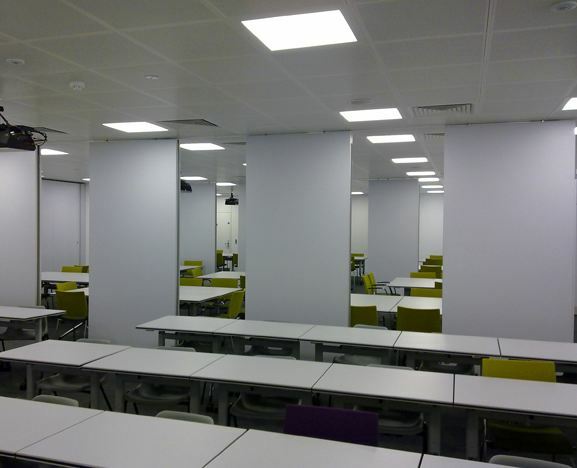 The panel width can be specified from 0.6m up to 1.2m. *How Good Is An STC Rating? 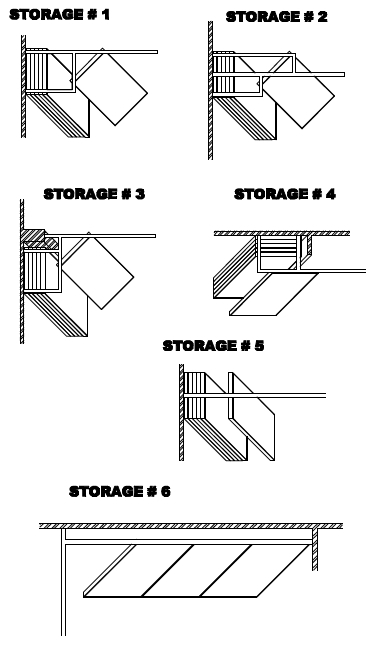 Preparation of opening shall conform to criteria set forth per ASTM E557 Standard Practice for Architectural Application and Installation of Operable Partitions. The partition Sound Transmission Class (STC) shall be achieved per the standard test method ASTM E-90-99 and E 413-87. Limited warranty of five years for the rail tracks and carriers. Three years on panels and mechanical parts and one year on labor. Limited warranty shall not include panel finish, freight, shipping, and transportation cost. This warranty shall be against defects in materials or workmanship of manufacturer’s products. Individual panels shall be nominally 55 mm thick. The MDF panels are mounted and attached to anodized architectural grade aluminum alloy 6063 T5 vertical stiles and are top supported by factory fabricated steel tubular carrier weldments. Vertical sound seals shall be deep nesting extruded semi flexible PVC tongue seals on aluminum groove. 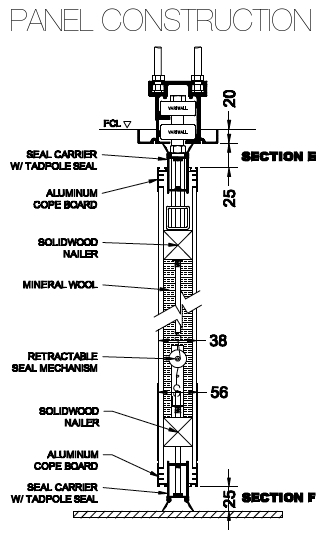 Depending on the STC model, the horizontal top seals maybe fixed attached or shall be mechanically operated. The top and bottom horizontal seals shall be operated by a crank shaft and pulley mechanism with a telescopic action. Both top and bottom horizontal seals shall be operated simultaneously with a heavy duty spring loaded, single action 180 degree cranking mechanism. Mechanical seals shall provide a force at the top and bottom of panel in order to seal off any gaps and afford extra lateral stability for the panel. 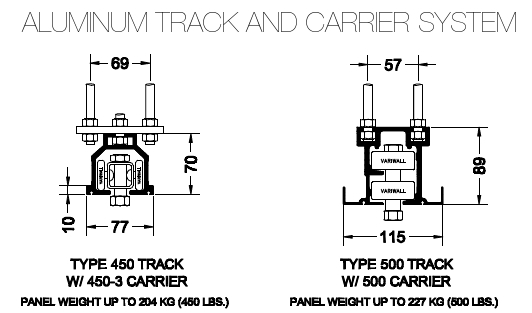 There are two types of track available, the omni-directional Type 500 and the center-suspended Type 450. Both types of track are anodized aluminum architectural grade alloy 6063 T6 annealed. Track intersections, escapements and storage shall be made of the same type and aluminum grade as the main rail. There are two types of carrier systems available, the Type 500 which is a dual precision ball bearing with moulded in place Delrin tires and has a 225 kgs. load capacity for omni directional track. Panels in an omni directional track shall be able to traverse X, T or L intersections. The other carrier type is Type 450-3 which is used for the Track Type 450. The Carrier Type 450-3 is a triple precision ball bearing with moulded in place polymer tires and has a 204 kgs. load capacity. The highly-precise aluminum track and steel ball bearing with polymer tired carriers provide a smooth and quiet panel operation. There are three types of Trail Panel Closure available: The Hinged Door Panel, Pivot Door Panel, and the Lever Closure Panel. 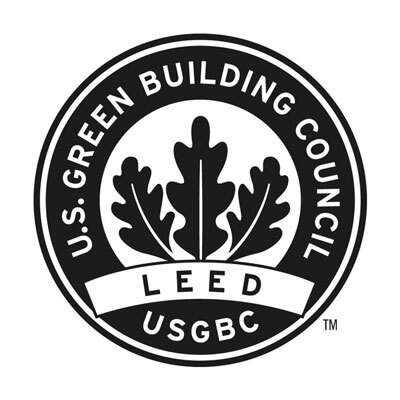 There are also two types of Lead Panel Closures available in the Screenmaster 550® series: the End Rubber to Wall Receptacle and the Vertical Stile to Wall Jamb. The VARIWALL® Screenmaster 550® series offers six different Panel Stacking Systems that covers all possible project requirements. These can be configured in several combinations to provide even more options. - Bare Finish: MDF, Plywood. - Imported Vinyl Laminates. These shall be machine laminated, hydraulically pressed and factory applied. Color shall be selected from manufacturer’s standard color selection. - Woven Fabric with Polyfoam backing. These shall be factory applied and installed. Colors shall be selected from manufacturer’s standard color selection. - Melamine. These shall be factory applied and hydraulically pressed and laminated. Color shall be selected from manufacturer’s standard color selection. - High Pressure Laminates (HPL). These shall be factory laminated and hydraulically pressed and cured. Color shall be selected from manufacturer’s standard color selection. - Aluminum Rails and Frames shall be anodized silver satin finish. - Powder Coated Finish is an option. Color shall be selected from manufacturer’s standard color selection. - Single pass doors, double pass doors of the same thickness, construction and finish as the basic panels. - Whiteboards, marker boards, tack boards may be specified. - Door locks, latches and handles. - Glass windows on doors are optional.